Try as I might, there’s no use denying it anymore. Summer disappeared pretty rapidly about a week ago and since then Vancouver has descended into near-constant rain. This isn’t unusual for the time of year, but we always seem to be unprepared for the shock of cooler weather and the loss of long summer days. I actually quite enjoy this time of year because I love nesting – being cosy and warm indoors and having an excuse to take long warm baths. I’m essentially a hibernating creature. And with cooler weather comes warmer foods like chilis, stews, curries and roasts. This time of year is perfect for these because we’re still enjoying plenty of freshly harvested produce. If you have a farmer’s market nearby I highly recommend scouting out local fruits and vegetables – they’ll invariably taste better than anything you buy in supermarkets. At the moment I’m a big fan of warming Thai curries. They’re quick and easy to make for a mid-week dinner, and are satisfyingly hearty on cold, rainy days. You can buy or make your own curry paste (recipe to make your own coming to the blog soon!) and you can put almost any vegetables in them – meaning they’re a great way of using up whatever is in your fridge! This Thai Yellow Curry contains chickpeas, sugar snap peas, cabbage, red pepper, bok choi and courgettes/zucchinis, but you’re welcome to sub in any other vegetables if you’ve got some that need using. One note: this curry is not thick – it’s meant to be slightly more ‘soup’-like, based on some I’ve had in the past and loved. That said, the liquid should be really flavourful and tasty – if it’s not, there are a couple of things you can try. 1) Make sure you have a really high quality full-fat coconut milk – not all coconut milks are created equal! Some are mainly water and will just make your curry watery and bland. When you open the can, the milk should look thick and creamy, not thin and watery. 2) Make sure you drain the water off the chickpeas if you’re using canned ones. 3) If you’re using stock cubes, try using the same amount in less water – that will cut down on the liquid content of your curry drastically. Enjoy! First, prepare all the vegetables as instructed. Add all ingredients except the leafy bits of the bok choi to a large saucepan, stir to combine and bring the mixture to a boil. Reduce the heat, cover the saucepan with a lid and simmer gently for about 15-20 minutes, or until the zucchini is soft enough to eat. Gently stir in the bok choi leaves and simmer for one more minute. 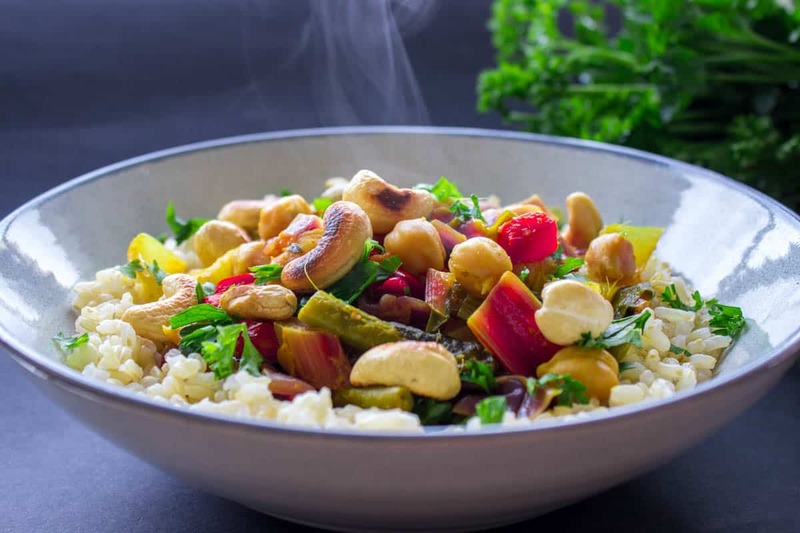 Remove from the heat and serve in large bowls with brown rice, toasted cashews and cilantro. 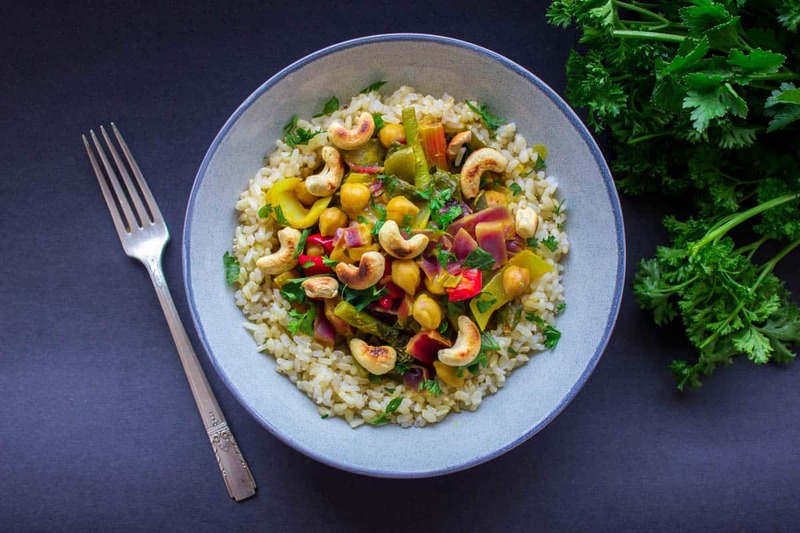 I like to garnish my curry with toasted cashews, seeds and chopped cilantro because I love an explosion of colour in my food – particularly in the colder months! This is totally optional however – feel free to garnish as you wish and get creative! I saw this recipe in a magazine I bought with a Veganuary meal plan, and I made it tonight. My question is – is the stock really necessary? I made it as written and it turned out extremely watery, to the point I had to drain it before I could eat it. Did I do something wrong? – try using a stock cube (I assume you’re using cubes) in half or quarter the amount of water suggested in the recipe, that way you’ll still get the flavour but without the extra liquid. – make sure you’re using a high quality, full fat coconut milk (as lower quality milks can have a high water content). 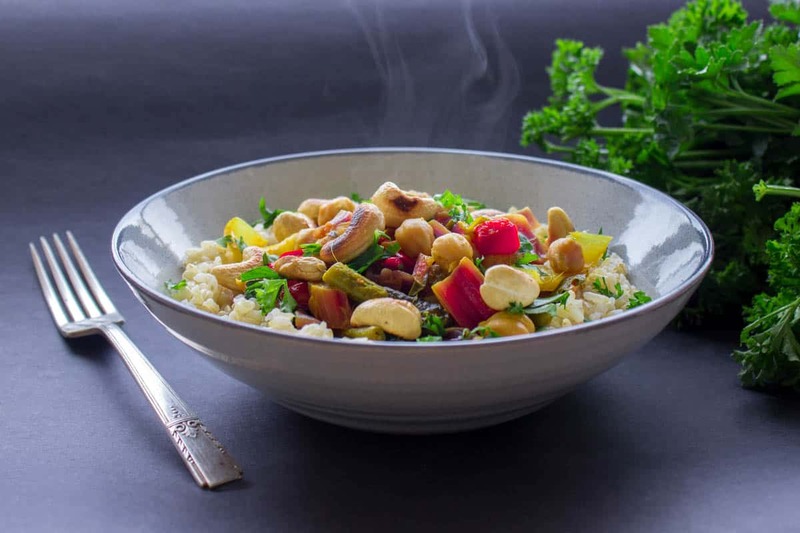 – make sure you drain the chickpeas before adding them (if using tinned).